ABC Dry Chemical is a multipurpose extinguishing agent that is suitable for use on Class A, Class B and Class C fires. Typical Uses: For public areas such as offices, classrooms, churches, parking garages, and hotel/motel assembly halls and guest areas. For businesses such as retail stores, light manufacturing facilities, research facilities, auto dealerships, vehicle/ aircraft/marine service centers, and manufacturing processes such as painting, dipping, and coating. Not recommended for use on sensitive electronic equipment or aircraft structure. Watch for quantity DISCOUNTS always at BIGDAVESYARDSALE!!! 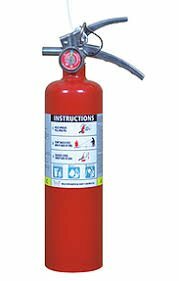 If you have any questions about this product by Type ABC Dry Chemiclal Extinguisher, contact us by completing and submitting the form below. If you are looking for a specif part number, please include it with your message.